Jeremy is an original member of Softball Austin. He began his playing career in 2001 as a member of the Hornets, playing for David Derbonne on the same city league as the Bat Boys. In 2002 He started a new team, the Big Bad Woofs. The Woofs played in the same city league as the Bat Boys, and won one game their first year, a forfeit! Spring of 2003 the Woofs traveled to Houston for the Memorial Day Tournament. The Woofs ran through The D bracket and finished in 2nd place! Labor Day weekend of 2003 Jeremy joined Lee Curtis and 4 teams from Austin, Dallas and Houston for the inaugural Selma's Softball Splash. In 2004 Jeremy and Lee hosted 16 teams from Texas and Oklahoma in a C & D Tournament at Del Valle fields in the Softball Austin Spectacular. During this time, He also set up the first Softball Austin website and was the first Secretary of the Softball Austin Board of Directors. The Big Bad Woofs played in the inaugural season of Softball Austin in the fall of 2004. 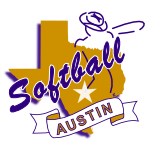 In 2005 Lee and Jeremy hosted the Softball Austin Texas Shootout with 26 teams from Texas and Oklahoma. After a too long hiatus, Jeremy returned to Softball Austin as a member of the Bout Time II Ballr'z. 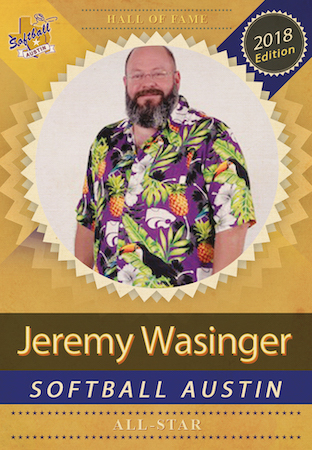 Jeremy has also served as Softball Austin Archives Chairman. 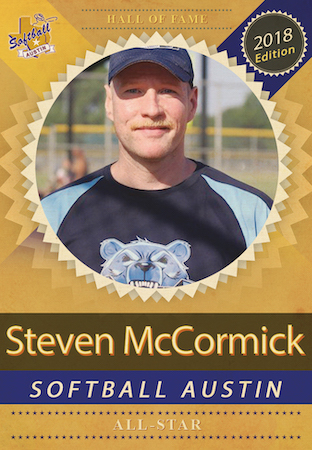 Steven "Ginger" McCormick started with teams in the Austin City League prior to Softball Austin forming, playing with the Stars and Big Bad Woofs (2003-2004). He took a hiatus from softball to start his career as an Austin Police Officer and came back to Softball Austin in 2010 to play on the Ball Busters D team where he earned the nickname "Ginger" which has stuck with him to today. In 2011 he joined the Polar Bears D team as a player and took over coaching in 2016. In 2017, along with the help of Norman Coopee, he brought back the Grizzlies C team which he currently plays on and co-leads. He has played in 3 World Series including Minneapolis, Columbus and Austin, as well as may out of town tournaments in Las Vegas, Houston, Dallas, Seattle, San Antonio and New Orleans. In addition to his playing and coaching, Steven has served on the Softball Austin Board as Competition Coordinator (2015-2017), Assistant Commissioner (2017-2018) and currently serves as Commissioner (2018). He has also served as co-director of the Texas Shootout Tournaments in 2016 and Director in 2017 and 2018. Over the years he has also served as chair of the following committees: Protest, Ethics, Bylaws/IOG and Ratings, as well as serving as a national North American Gay Amateur Athletic Alliance (NAGAAA) delegate for the league. Thomas Volz moved to Austin in the Spring of 2011. He was introduced to Softball Austin by a neighbor who was a current player. Upon invitation to an open tryout with the Rough Riders (C Division Team) and Show Us Your Hits (D Division Team) , he tried out and was asked to play for the Rough Riders under the management of Albert Rodriguez. Without much experience with softball and not knowing many people, Softball Austin became a second family to him. He grew into the league to eventually assist with the coaching of the Rough Riders in 2013. He took over the management and coaching of the Rough Riders in 2014. Over the past seven years within the league, he has participated in five World Series with the Rough Riders and assisted several other teams with the GSWS including a fifth place showing with Pride and a second place showing with Fusion. He was with the Rough Riders when they placed second in the Sin City Shootout in 2012. He has led the Rough Riders to a fifth, second, and third place showing in the Texas Shootout the past three years and several other top five wins in other NAGAAA tournaments throughout the US. In the past two years, he has taken on coaching a D division team along with the Rough Riders. As coach of the D team, the Warriors, they qualified for the GSWS in Austin with a tenth place showing after the Spring 2016 season. The Warriors then regrouped to form Austin 512 in the Fall of 2016, and the following year took fifth place in the Portland GSWS. He has since taken over management of Austin 512 in the Spring season of 2018. He has led both the Rough Riders and Austin 512 in qualifying for the 2018 GSWS in Tampa along with coaching assistance from fellow Austin Softball member and friend, Oscar Leal. In the past six seasons with both the Rough Riders and Austin 512, both teams have consistently finished among the top three Softball Austin teams in their respective divisions. Since taking over coaching and managing, he attends and participates in many of the Softball Austin Council Meetings, and is on the Ethics, Ratings, and Protest Committees. 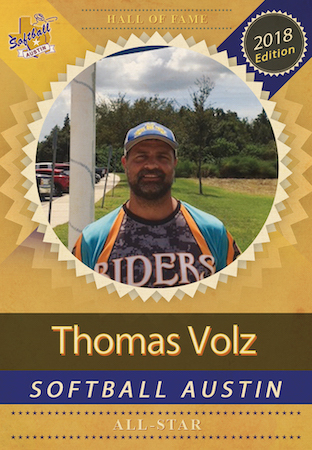 Tom is involved with recruitment days, promotes the league by opening his teams' practices to both non-members and members of Softball Austin, and helps rate new recruits to place them on appropriate teams. He would also like to recognize his boyfriend, Luke Porter, for always being there and supporting him with so much time and effort that goes into running two teams and playing pretty much year round with Softball Austin and City League.